Stay hydrated and fully stocked with the Nathan TrailMix Plus Insulated Hydration Belt. 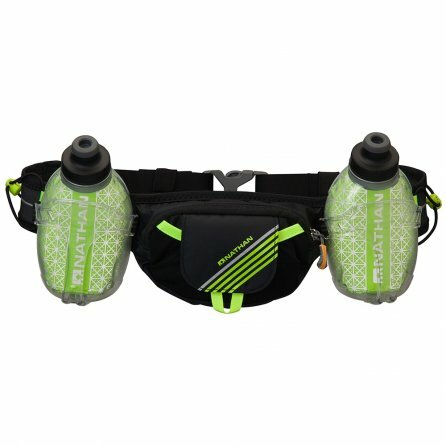 This lightweight belt comes with two 10oz reflective water bottles that include Nathan’s Fire & Ice Technology that keeps water colder for longer. You also won’t have to worry about getting to your bottles as the TrailMix Plus comes with SpeedFit™ holsters that provide easy access while on the move. The belt itself also offers a plenty of stretch and won’t hinder your stride while moving, thanks to its ergo-shaped design. Storage won’t be a problem with a spacious zip pocket to keep your gels, snacks, and phone secure in one place.